Nature's Logic Dry Diets provide a blend of USA-raised meat with dried vegetables and fruits. 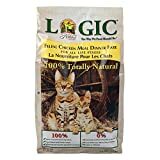 Nature's Logic dry dog food flavors include: beef, chicken, duck and salmon, lamb, pork, rabbit, sardine, turkey, and venison. Nature's Logic Dry Diets is appropriate for dogs of all ages, sizes, and breeds.